When it comes to timing the next recession - or the next Fed policy mistake - there are few signals that pundits rely more on than the shape of the yield curve, which, as we have covered extensively in the past year, has bear flattened dramatically since 2015 as the Fed has hiked rates, with the 2s10s now just a tiny 20bps away from inverting at which point the countdownto both a recession and a bear market begins. However, at a time of unprecedented central bank meddling and manipulation in all rates (and equity) markets, many believe that the longer-dated curve is no longer indicative of anything but noise, especially since the long-end is directly being bought by central banks (or sold by Chinese reserve managers depending on how much Trump's trade war escalates) thus distorting any "signal" value it may have. In its place, a more accurate "signal" has emerged in the short-end of the curve, as manifested by the Overnight Index Swap, or OIS, futures market. 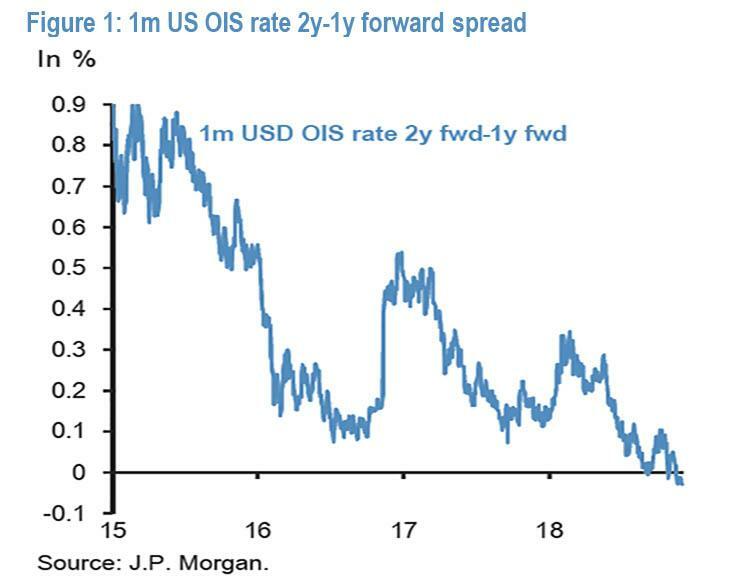 It was here that back in April JPMorgan observed something very notable: the forward curve for the 1-month US OIS rate, a proxy for the Fed policy rate, had inverted after the two-year forward point for the first time this cycle. This implied some expectation was priced in of a reduction in the Fed policy rate after Q1 2020; that or the market starting to actually price in - and not just contemplating - the next Fed policy error, i.e., hiking right into the next recession. This is a big deal: as JPM's Nikolaos Panigirtzoglou wrote, an inversion at the front end of the US curve is a significant market development, not least because it occurs rather rarely, and has happened only three times over the past two decades: in 2005, 2000 and 1998 - all periods in time preceding major market busts. While redundant, JPM explained that "such inversion is also generally perceived as a bad omen for risky markets" and highlighted that the two potential explanations are either markets pricing in a Fed policy mistake, or pricing in end-of-cycle dynamics. Fast forward to today, when 8 months later, Panigirtzoglou writes in his latest Flows and Liquidity commentary that since then, not only has this inversion worsened, but it has shifted forward, and since the middle of November, the forward curve is inverted between the 1-year and the 2-year forward points. This shift forward in Fed policy reversal expectations is in line with historical experience. As JPM wrote back in April, the 3y-2y forward rate spread had historically led the 2y-1y one, and this has now occurred since mid-November. What does this mean in practical terms? Simple: the latest curve inversion implies that markets are now pricing in a peak in the Fed policy rate in end-2019 rather than during 2020 previously. 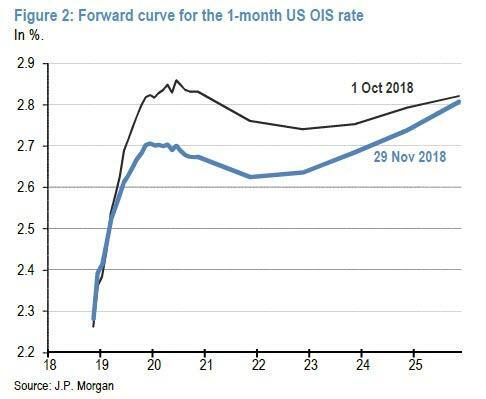 JPMorgan shows this in Figure 2, which depicts the forward curve of the 1-month dollar OIS curve currently vs. its snapshot at the beginning of October before the equity market correction. Not only has the market-implied path of policy rate expectations shifted downward in the aftermath of the equity market correction, but the whole curve has shifted forward. And this week’s comments by the Fed Chairman appear to have reinforced these policy reversal expectations with the 2y-1y forward rate spread inverting further to below -3 basis points. Of course, as we discussed extensively in April, such pronounced shifts forward in Fed policy rate reversal expectations has also traditionally been associated with end-phases of the US monetary policy cycle. In the 2000 monetary policy cycle, the 3y-2y forward rate spread of the 1-month OIS rate turned negative in February 2000. 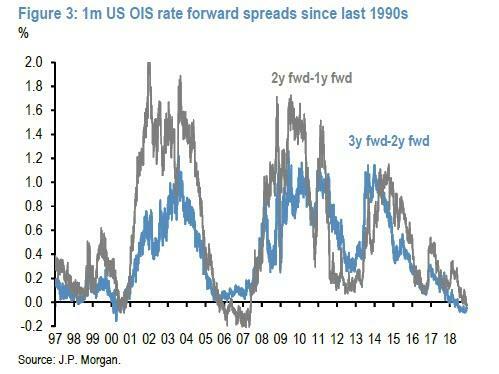 And as JPMorgan adds, the 2y-1y forward rate spread turned negative four months later in June 2000. The Fed delivered the last hike in May 2000. In other words, from a timing point of view, the last hike of the Fed at the time almost coincided with the inversion of the 2y-1y rate forward spread. Incidentally that also marked the bursting of the dot com bubble, as the US equity market had started declining at roughly the same time in June 2000. The subsequent equity market correction induced the Fed to start cutting rates in 2001. Fast forward to the next rate hike cycle, when in the 2006 monetary policy cycle, the 3y-2y rate forward spread of the 1-month OIS rate turned negative rather early in August 2005. The 2y-1y forward spread turned negative ten months after in June 2006. Similar to the 2000 cycle, the last hike of the Fed at the time in June 2006 coincided with the inversion of the 2y-1y forward rate spread. There was one material diference to the 2000 cycle: the equity market had started declining much later in October 2007 when the Fed started cutting rates. Rather concerningly, here JPM notes that although it is still early to draw conclusions, the lags from the 3y-2y inversion to the 2y-1y inversion and the September peak in the US equity market appear more consistent with the 2000 rather than the 2006 cycle. Now as readers may recall, when the 3y-2y forward spread inversion first emerged last April, JPM argued that an inversion at the front end of the US curve "was a bad omen for risky markets." So, perhaps not unexpectedly, the ensuing 2y-1y inversion and shift forward in Fed policy rate reversal expectations is, according to JPMorgan, "worsening this bad omen." Why? Because in even more bad news for the BTFD crew, the lesson from the previous US monetary policy cycles is that a sustained recovery in equity and risky markets has tended to occur only after the inversion disappears and the front end of the US curve, in particular the 2y-1y forward rate spread, resteepens. Negative implications for the stock market aside, as we briefly mentioned above JPM previously argued back in April that this yield curve inversion could be consistent with two potential fundamental explanations: markets have been either pricing in a Fed policy mistake or end-of-cycle dynamics. As Panigirtzoglou explains, while it is difficult to distinguish between the two - especially as a Fed policy mistake be definition naturally shorten the cycle - there should be some distinction in terms of investor flow patterns. Pricing in a Fed policy mistake should induce investors to focus on earlier growth weakness and should, therefore, be accompanied by weak equity fund flows, weak cyclical sector flows, greater flows in long-dated bond funds vs. short-dated ones on potentially earlier reversal of US monetary policy, and weak flows in interest rate-sensitive sectors such as housing. Pricing in end-of-cycle dynamics should be accompanied by overheating and inflation concerns, i.e. greater flows into inflation-protected vs nominal bond funds, greater flows in short-dated vs. long-dated bond funds on later reversal of monetary policy and greater flows into cyclical sectors and equity funds, in general, as the best equity and cyclical sector returns are typically seen at the end of the cycle. There should be less distinction in terms of credit flows as credit should respond to higher uncertainty and volatility and underperform under both Fed policy mistake and end-of-cycle dynamics. So the weakness seen in credit flows this year, especially in HY bond funds, is in our opinion less useful in helping to distinguish between the two hypotheses. 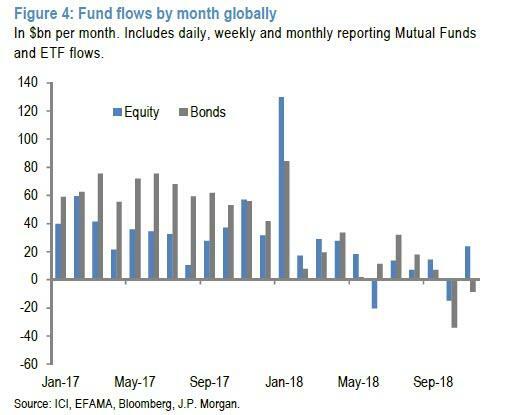 1) The trajectory of equity fund flows has been rather weak and erratic since last February with no signs of change in the most recent months. 2) Flows into cyclical vs. defensive equity sectors. Since the yield curve inversion first emerged last April, inflows into US sector ETFs have favored more defensive sectors such as Staples, Healthcare and traditional Telecoms, while outflows have focused on cyclical sectors such as Financials, Industrials and Consumer Discretionary. 3) Relative flows in inflation protected vs. nominal bond funds. 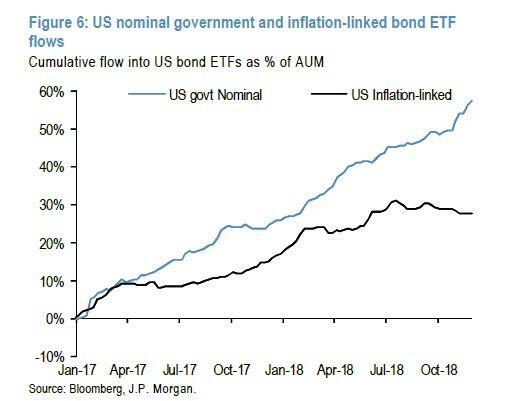 The chart below splits overall US government bond ETF flows into nominal and inflation-linked bonds. Nominal bond funds have had steady inflows since the start of the year, while flows into inflation-linked government bond ETFs have been negative since July. 4) Relative flows in short-dated vs. long-dated bond funds. The duration impulse of flows into US bond ETFs has decreased this year, with inflows going mostly into shorter-term and floating-rate rather than longer-term bond ETFs. And if anything, this trend has intensified in the most recent months. 5) Interest rate-sensitive sector funds such as REITS have seen significant outflows in the US relative to a flattish pattern globally. In other words, according to JPM, flow metrics 1, 2, 3 and 5 look more consistent with the Fed policy mistake hypothesis, while the flow metric 4 looks more consistent with the end-of-cycle hypothesis. JPM's's conclusion, incidentally, is the same as what it said back in April, namely that "while we recognize it is difficult to distinguish between the two hypotheses, there still appears to be more flow support for the Fed policy mistake hypothesis"
In other words, between the market's ongoing preoccupation with the US-China trade war, and traders suddenly pricing in either a policy mistake as the Fed continues to hike into an economic slowdown and eventually recession, or the end of the hiking cycle, it would explain the violent market selloff of the past two months, and the associated spike in volatility, as forward-looking investors and traders simply look to cash in their chips as suddenly the market is signalling that the trading environment observed just before the tech and credit bubbles burst, is once again imminent.